Supreme DVD ripping experience with No.1 fast speed and 100% original quality. 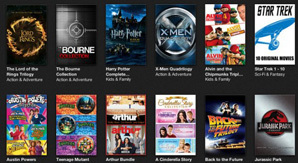 MacX is the ace DVD converter for Mac users to liberate movies and TV shows from physical platters. It can free rip DVD on Mac hard drive in digital format like MP4 that is much easier to preserve, archive, stream or watch on iPhone, iPad and HD TVs. Create a digital copy of DVD in hard drive as a safeguard against any scratch or damage. No more rebuying or battery-draining disc spinning. Unclutter your life with digital equivalents. Extend the use of DVD contents by freely converting DVD to MP4, MOV, H.264, iTunes to do more with them, like watch on iPhone, PSP, HTPC, Apple TV, upload to YouTube, edit or share with others. Stay abreast of current copy protections imposed on new and classic movies, TV shows, workouts and even damaged discs. Get you out of any locked discs from Sony, Disney and Warner Bros. Working with protected DVDs is a critical technology for competitive rippers, and MacX is leading the way. It cuts through the painstaking protection mechanisms and supports all knotty discs with CSS, UOP, RCE, region code, Sony ARccOS, for the sake of brevity, which common freeware cannot hold a candle to. It's a time-tested tool that frees you from constant DVD rip dilemmas like software stops/crashes halfway, no title found error, etc, makes it hassle-free to select the right title, and rips protected DVDs on Mac in MP4 or the like for playback effortlessly and seamlessly. Convert Any DVD to Any Format for Any Device If you just want a way to stream the DVD movies from NAS drive to your smart TV, watch the films on iPhone or iPad, or have your homemade DVDs shared on YouTube, etc, then you have it on tap. MacX extends the viewing options of DVD movies for the player-free future. It bombards you with a slew of output formats like MP4, H.264, MPEG4, MOV, M4V, MP3, etc that the smartphones, tablets, TVs, gaming systems and sharing sites accept. Freely rip and convert DVD to MP4, H264, MPEG4, MOV, MP3, iTunes, Apple TV, and so on. Convert DVD to fit, by and large, all kinds of screens, like Macbook, HD TV, iPhone, iPad, Android, PSP, etc. Backup DVD collections to hard drive/USB/NAS to save space for room & safekeep your investment. Digitize DVD to a media format that is editable in iMovie and sharable on YouTube and other online sites. A Real Time Saver - 5X Faster Ripping Speed Ripping DVD at peak performance and highest quality is what users care most, and MacX knows it. Our engineers push the boundaries to offer speeds you won't experience with any other free DVD rippers for Mac, backed up by a bevy of top-end techs, e.g. multi-core CPU, super encode engine and hyper-threading technology. Now, it has 5x faster conversion speed, that's no more than 10 minutes for ripping a full DVD movie (the computer configuration and disc drive speed matters). Plus, MacX presents you the rips with original quality kept maximally, without a single dropped frame. More than Just A Free Mac DVD Converter To deliver world-class free DVD rip experience, MacX goes a lot further than a DVD ripping freeware with a full set of exceptional bonus features tailored to support a variety of advanced DVD conversion. MacX is proud to offer users full control over the encoding process and takes a step further for the output content, all in the ripping task. An advanced video editor offers far-reaching options to use the ripped movie in a creative way. Remove the trailers and ads, cut favorite segments of the source movie, cut out black bars, crop video, merge titles together. With the intuitive Mac-style interface, MacX dramatically eases the ripping process and allow you to start a rip within 3 steps. No messing about or complex configuration. Just load DVD, choose format and go. Advanced encode algorithm, De-interlacing and High-Quality Engine make MacX the go-to ripper for the best balance between audiovisual quality and file size. The 5-8X smaller outputs ensure the highest quality on any display. Customize your DVD encoding. Simply change the video codec and resolution, adjust the frame rate and aspect ratio, up or lower the bitrate, set the audio codec, channels, etc to get the best possible result. MacX is the most time-efficient and speedy method with batch processing support. It saves valuable time when multiple DVD files can be queued and converted without interaction from the user. MacX makes easy work of removing, retaining and adding subtitles to the rips. Before the DVD conversion, you can freely enable the preferred audio and subtitle tracks, and even add external subtitles, if there's a foreign film. How to Rip a DVD on Mac for Free in 3 Clicks ? MacX makes even stubborn DVD rips a childsplay. You can freely transcode DVD to Mac in a media format viewable on iPhone iPad in just a few clicks away. 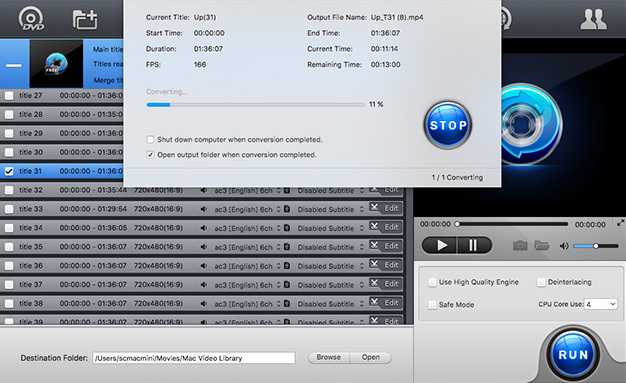 Digitizing DVD to MP4, MOV is that easier and faster. No tech experience required. Import DVD movie to your Mac by clicking "DVD Disc" button. 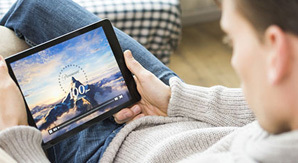 Select the targeted video format. 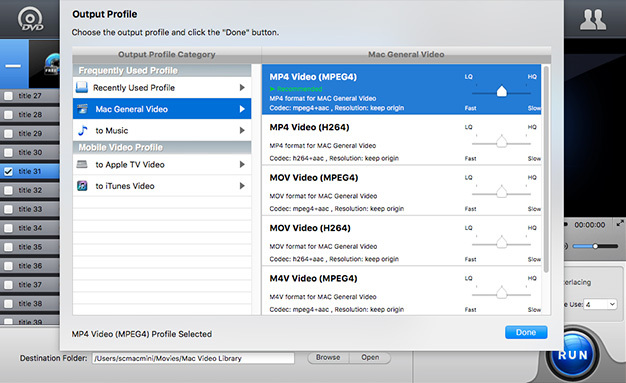 You can effortlessly rip DVD to MP4 H.264, MOV, or convert DVD to iTunes, Apple TV, etc. Accidentally find the freeware based on Tucows recommendation. It allows me to rip unencrypted and encrypted DVD movies to my hard drive. No crashes or quality loss even when ripping Disney DVDs on my Mac. The extracted files can be viewed on QuickTime or transferred to digital media devices. Comes with a comprehensive manual, it is very easy to use, even for my kids. I took a try of the software because of recommendation from my friends. Well after using it for a while, I understood why they all suggest me to download it. It takes no more than half an hour to convert a DVD movie, yet the output quality is exactly the same as original. And it works as advertised with latest protected DVD movies supported. Failed to Rip DVD? Here're the Fixes You may have run into different errors when ripping DVDs, for example, not reading discs, cannot find the main title, DVD ripping not completed, scrambled rips, out-of-sync audio, etc. MacX is expert in dealing with different discs with stable performance. How do you add subtitles to DVD movies? It's essential to add subtitles to movie, especially when watching a foreign movie. MacX DVD Ripper Mac Free Edition is available to rip DVD with internal/forced subs and add external movie subtitles in any foreign language. Just load DVD > click Edit > add subtitles and Done. Can Handbrake rip protected DVD on Mac? Handbrake rips any DVD that isn't encrypted, and you will go through errors like no title found or get scrambled video, even with libdvdcss installed. But you are better off getting MacX DVD Ripper. See how to freely rip protected DVD on Mac with DVD decrypter. Copy DVD on Mac with lossless quality Follow the guide to backup and copy your DVD collection on MacBook, iMac 5K, Mac Mini etc and save them on your computer hard drive or play them on the go with fast speed and high quality. How do I make my DVD region free? There are cases you want to unlock or change DVD region code, e.g. play region 2 DVD in U.S.A. MacX DVD Ripper frees you from resetting DVD drive's counter and makes all DVDs region free by converting DVDs to MP4, MOV, etc. See how to remove DVD region code. How to rip DVD with DVD Decrypter? Free download the best DVD decrypter to deal with all types of DVD discs, whether they are encoded with CSS, region code, Sony ARccOS or any other complicated schemes. How to remove DVD copy protection? Movie companies impose various methods of copy protections on DVDs to prevent illegal distribution. Those protection measures disable most free Mac DVD rippers from reading the disc. MacX stay top of the latest DRM schemes to remove the lock on your own purchased DVDs.